You would think in this day and age of high technology we would have something more technologically advanced to reduce a fracture in the operating room. However, we still use old-fashioned bone reduction clamps to hold the broken bones together while we are fixing the fracture. 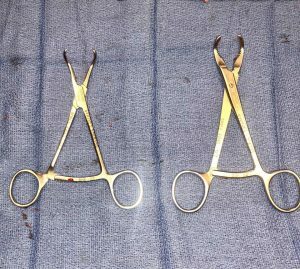 Imaged below are two different bone reduction clamps that I commonly use. The one on the left is called a point to point and the one on the right is called a lobster claw.